Toy Story 3 has been the film getting all of the attention lately, overshadowing the Pixar short film, Day & Night that is playing in theaters alongside it. I wanted to wait after my second viewing to review the short, as there are so many subtleties I missed the first time around, I deemed it necessary to watch it again before writing anything. In my write-up going behind-the-curtain of the short, I explored Pixar’s history with shorts and talked about the fascinating aspect of Day & Night, the combination of hand-drawn characters with their computer animated interiors. Reading about it when it was first announced, I was excited about the undertaking. After watching it, I can only say that director Teddy Newton is a genius. The story behind the short is simple: There are two characters, Day and Night, and they come into contact with one another. Each of the two has their own unique set of features that sets it apart from its counterpart. When they start to explore their differences, hilarity ensues. Viewing it for yourself will always be better than my description of the short’s plot, as the visuals are incredibly important to the story. Aside from a short portion of the film, there is no dialogue. The story progression occurs through the facial expressions of the characters, which is why the visual aspect is crucial. The animation, hand-drawn and computer, is stunning, and the 3-D utilization is some of the best that I have seen in theaters. The themes of respecting and celebrating others’ differences, along with looking for our similarities, that emerge from Day & Night are touching. It is also a message of hope and love fitting of the world’s troubled times. Before directing the short film, Teddy Newton worked as an animator with Brad Bird on The Iron Giant and several Pixar films. His work can be seen in the many “Art of…” Pixar books put out by Chronicle Books. It does not take long to notice that Newton possesses a unique vision. He originally had the idea for Day & Night years ago, but as is the Pixar way, some of their best pieces of work have a gestation period before they are fully realized. I walked out of that theater amazed at the one-two punch delivered by Pixar in Day & Night and Toy Story 3. The new Toy Story film may be getting most of the press, but Teddy Newton also deserves acclaim for never giving up on his idea and allowing his creative imagination to run wild. 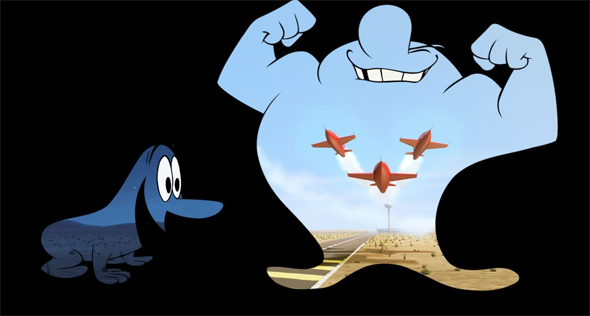 What did you think of Pixar’s new short? Comment and share your thoughts below.